ESO Supernova Exhibition — What makes a star shine? In the core of a star, light atomic nuclei fuse together into heavier ones. This process, called nuclear fusion, generates a star’s energy. The new atoms end up in our bodies much later: We are made of stardust! Controlled fusion: Prototype fusion reactors recreate the conditions in stellar cores. In the future these reactors will create cheap energy. Fusion reactor: All of the Sun’s energy, including the radiation of this powerful are, is generated in the core by nuclear fusion. Without it, life on Earth would be impossible. Shortly after the Big Bang, the Universe consisted almost entirely of hydrogen and helium atoms – the two lightest and simplest elements in nature. But in the cores of stars, pressures and temperatures are high enough for simple atoms to fuse into more massive ones. During the process, a small fractionof the atomic mass is converted into energy – this is the reason why stars shine. Through stellar winds and supernova explosions, the newly generated elements – like carbon, oxygen and iron – are dispersed into space, where they end up in planets, people, and everything in the world around us. Balancing Act: In a star’s interior, there’s an equilibrium between the inward pull of gravity and the outward push of gas pressure. Without fusion a star would collapse under its own weight. 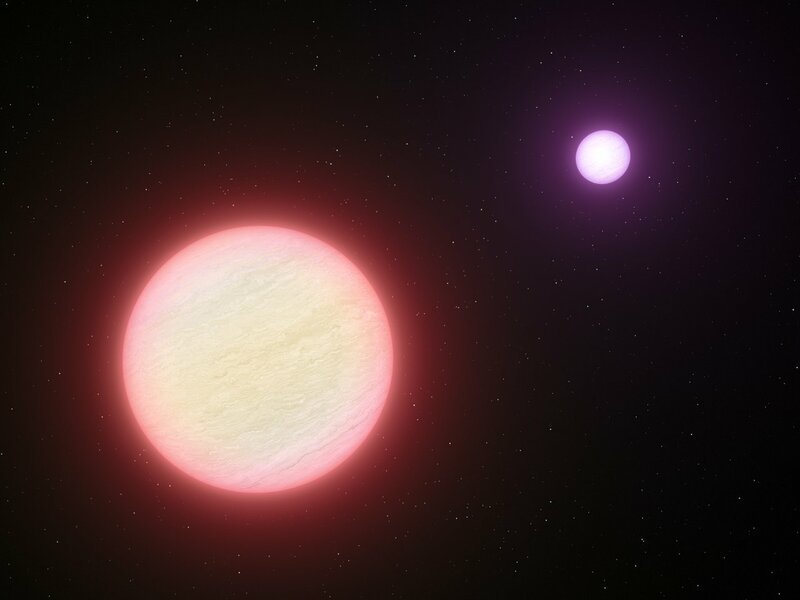 Failed star: Brown dwarfs are failed stars. They are not massive enough to sustain hydrogen fusion in their cores. (artist‘s impression). The surface of a star looks like a raging fire. But a star doesn’t really burn. The energy of stars is nuclear energy, made deep inside them. The “ashes” left behind are new atoms, including the atoms in your body.